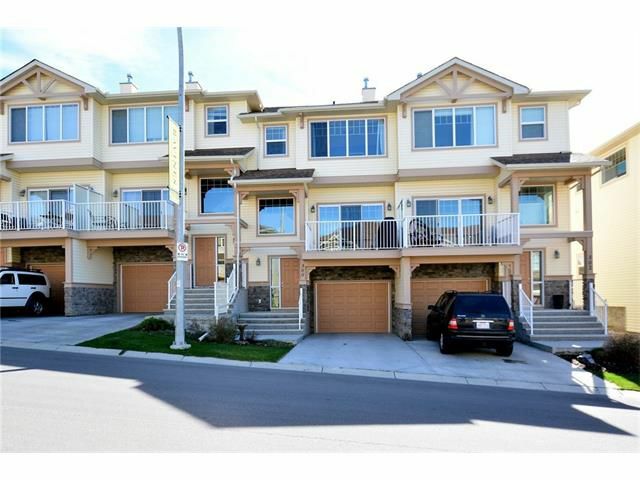 Welcome to this immaculate 3 bedrm townhome at 300 Sunset Point, where the living is easy and the views are stunning! Admire the Rockies from the front balcony & grand master bedrm, and the open green space from the rear deck! A spacious, open main floor with 9' ceilings welcomes you with a large living rm & cozy fireplace, island kitchen w/ Stainless Steel appliances (including a gas stove), and huge dining area. A convenient 2 pce bath is nicely tucked out of the way. Upstairs, you will find 3 bedrooms & 2 bathrooms, including a good size master with 3 pce ensuite (look for the 'secret' cabinet here), 2 closets (1 walk in) & incredible views. Upper floor laundry rounds out this floor. A great feature of this home is the extra long dbl tandem garage w/ 10' wide garage door. Fits a full size truck plus quads / toys, etc. or 2 average size cars. Still room to park out front as well. Extra storage/mech. room off garage, hi-eff furnace and b/i vac as well. Priced to move, and move-in ready! See it today!